Taiwanese hardware manufacturer Lanner Electronics has released a networking appliance based on AArch64 architecture with silicon designed by Cavium. The Lanner MR-810 platform features Cavium’s ThunderX System-on-a-Chip (SoC) with integrated 10GbE, 40GbE networking which could be used as a platform for security applications or network function virtualization (NFV). “Cavium’s ThunderX workload optimized SoCs provide an ideal building block for Lanner to enable optimized platforms for specific networking and security workloads,” said Terence Chou, head of Lanner’s Network Computing Product Division. Lanner is a Taiwanese manufacturer that was established 30 years ago as GES Taiwan, a subsidiary of GES International. In 1993 the company separated from the GES group to focus on industrial computers and embedded systems. Over the years, Lanner built up expertise in hardware based on both x86 and Reduced Instruction Set Computing (RISC) architectures. With RISC systems, the company has traditionally favored MIPS, not ARM. MR-810 breaks this pattern by integrating two ThunderX processors in a dual socket configuration, with up to 48 cores each. 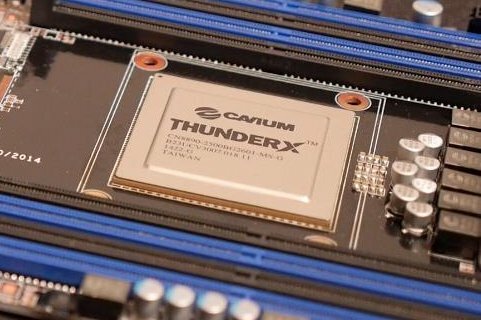 ThunderX features custom processor cores designed by Cavium under architectural license from ARM. These “workload-optimized” chips offer 10GbE/40GbE networking on the die and have built-in hardware accelerators for packet processing, deep packet inspection and common security tasks. MR-810 will feature a number of configurable 10GbE, 40GbE, copper and fiber network interfaces. Lanner says it can serve a hardware platform for a variety of networking and telecom applications such as enterprise firewalls, cyber security, intrusion detection/ prevention, application delivery, WAN optimization and NFV deployments. “ThunderX ARMv8 CPUs were designed to deliver best-in-class performance and TCO for targeted workloads,” said Steve Klinger, GM for Infrastructure Processor Group at Cavium.